This week’s fact sheets feature several pieces of equipment to be used when tending to animals, and they’re shown performing tasks that many players will be familiar with: transporting and unloading hay, loading a feed mixer, and delivering the feed. Here they are! 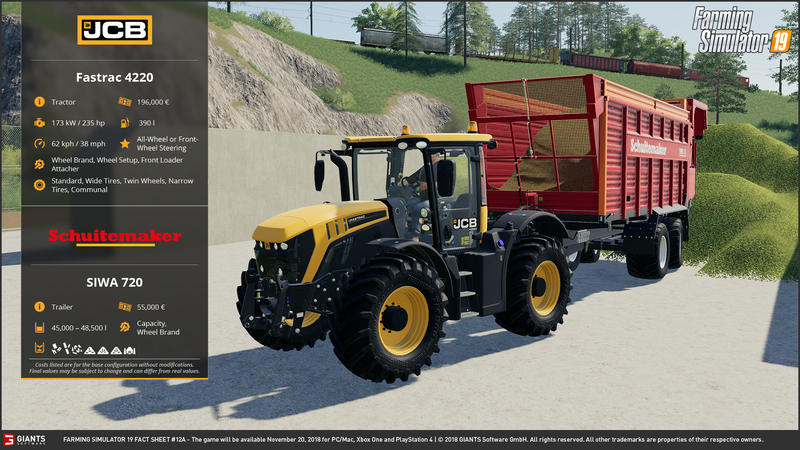 JCB has been a staple in the Farming Simulator series for quite some time now, however the Fastrac 4220 is new to the game. Farming Simulator 17 featured the Fastrac 3000 and 8000 series, which are generally more popular with the game’s European market than those in North America. One thing is for sure, the Fastrac line of tractors lives up to its name, and is excellent for transporting equipment long distances and on roads with a top speed of 62 km/h (38 mph). The Fastrac 4220 will offer a lot of options as well, with a choice between all-wheel or front-wheel steering (all-wheel steering should allow for excellent maneuverability in tight quarters), and a number of different tire setups. New Holland didn’t have a wheel loader entry in Farming Simulator 17 (outside of mods, of course), but here we get our first glimpse of one of their beastly loaders in-game for the first time, in all its beautiful modeled-by-GIANTS glory. The W190D is a great looking loader, with sleek black rims contrasting the bright yellow body. 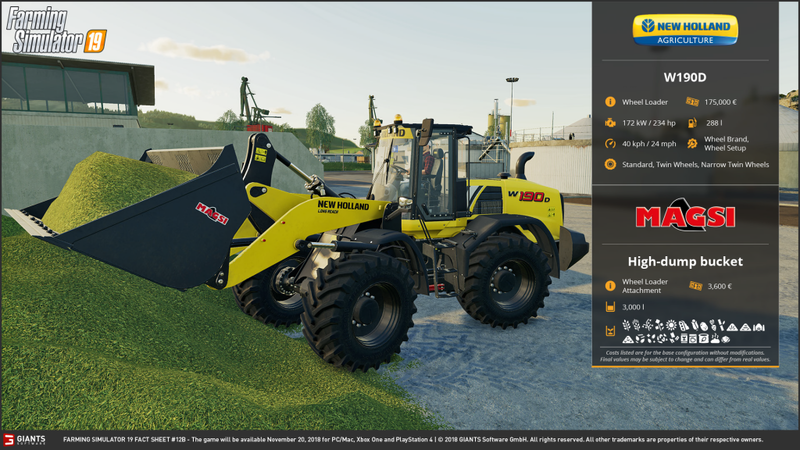 This isn’t just the first New Holland wheel loader, this is also the first time we’ve seen customization options on a wheel loader in a Farming Simulator game as well. [Author’s note: It was brought to my attention that both the JCB and Liebherr wheel loaders in Farming Simulator 17 had twin wheel options, which escaped me at the time of writing. Thanks to those who pointed this out!] The W190D will offer a choice between standard (shown), twin wheels, or narrow twin wheels. While these likely won’t offer much of a functional purpose, it’s still nice to be able to choose just how the loader will look (I’m sure the twin wheels will make it appear extra beefy!). 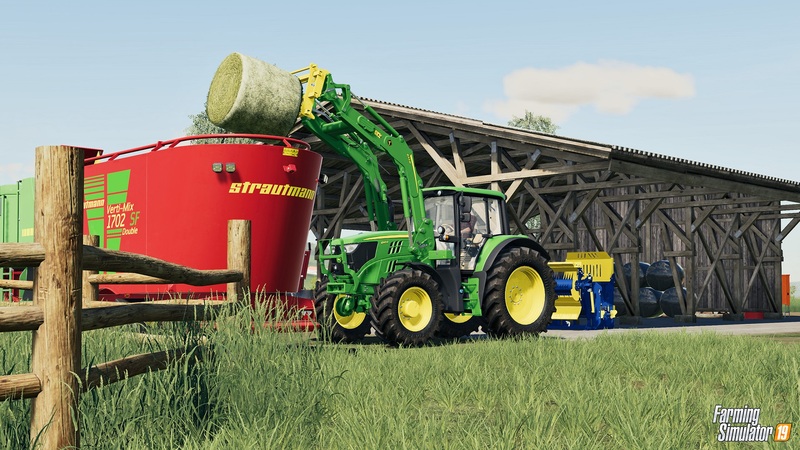 MAGSI has had a long-time presence in the series as well, and the bucket shown here is relatively modest in size – its 3,000 litre capacity is significantly smaller than the 4,500 litre capacity of its wheel loader bucket in Farming Simulator 17. However, I’m hopeful that we’ll see a larger option offered as well. It likely goes without saying that the bucket can pick up absolutely everything in the game outside of liquids, so it can be used in a wide variety of applications. 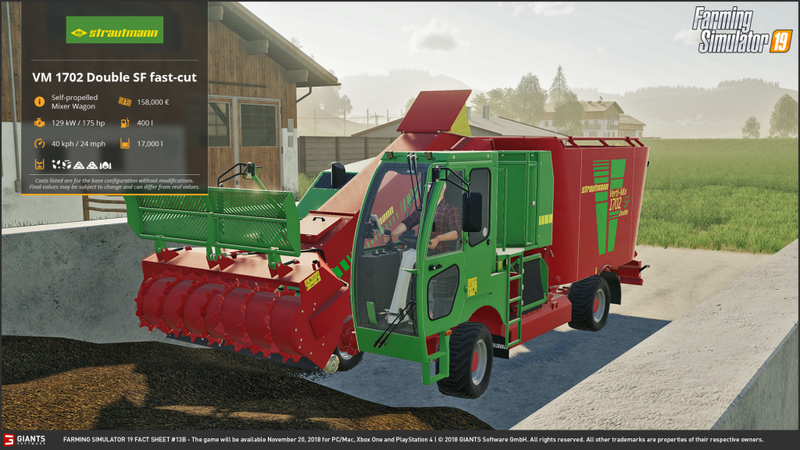 Since the news that there will only be one John Deere combine in Farming Simulator 19 started making the rounds through the fanbase, players have been wondering what other John Deere equipment we might see. While we saw a brief glimpse of the John Deere 6R series in the harvesting crops gameplay trailer, we hadn’t heard or seen anything else about the agricultural giant since then – until now. The 6M series is pictured depositing a bale of hay into a Strautmann feed mixer (see below for its fact sheet!). Some may wonder what the difference between the 6R and 6M series is, or if they’re even actually different tractors. A 2015 news release from John Deere indicates that the 6M tractors are slightly smaller than the 6R Series, and are well suited to haying and field work; loader, feeding and material handling. The 6R Series are considered “premium specification tractors”, offering additional horsepower, cab and control options, and more performance features to handle larger chores and field operations. This fact sheet also shows off John Deere’s proprietary front loader setup – in previous Farming Simulator games, players would have to buy a front loader of another brand (typically Stoll) and attach it to their tractor. In this case, John Deere tractors will sport their own loader systems, which is much more realistic. In addition to being able to attach a front loader, the 6M offers a host of different options, with pretty much any wheel setup you could imagine. 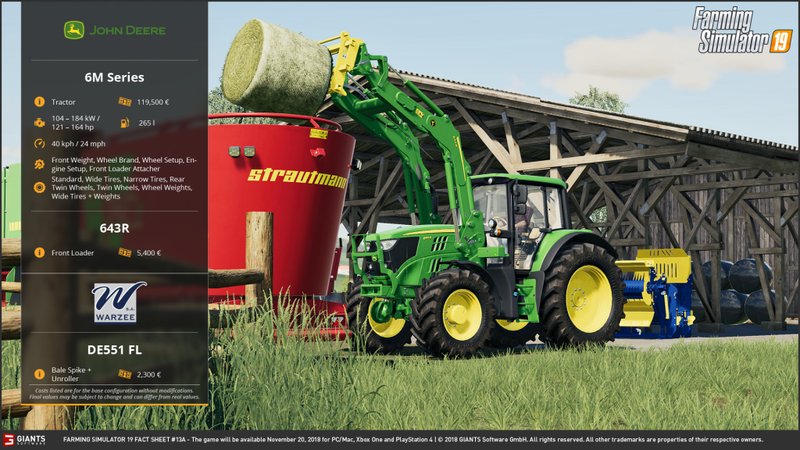 Self-propelled mixer wagons have been featured in previous games, and Strautmann has been featured in previous games, but we haven’t seen a Strautmann self-propelled mixer wagon in a Farming Simulator game before (usually the brand is limited to loading wagons). This mixer wagon will accept straw, hay, and silage to make “total mixed ration” (TMR) for cows, which increases their productivity. Thanks to a handy legend that GIANTS provided in a developer blog, we know that the other two icons on the fact sheet are “forage” and “forage (mixed)”. The difference between these two is that one represents feed mixed properly, and the other indicates feed where you didn’t get the ratio quite right. The VM 1702 boasts a fairly large capacity at 17,000 litres – the Siloking self propelled mixer wagon in Farming Simulator 17 only had a capacity of 13,000 litres, while its towable counterpart had a capacity of 16,000 litres. This means that the Strautmann is both larger and self-propelled, an excellent combination. Each and every week of fact sheets gets me increasingly excited for Farming Simulator 19‘s release on November 20 – make sure to follow Scholarly Gamers for all the news leading up to the big day!